Do you get tired of serving your children grisly, greasy chicken nuggets from the freezer or a fast food restaurant? Cook’s Country Magazine has the solution. A recipe that results in tender, juicy, well-flavored chunks of chicken breast with a crispy coating. I don’t fry foods often, even though I’m from the South, aka the Land of Fried Foods. Frying makes such a mess, and I hate kitchen clean-up! But these Crispy Chicken Nuggets, let me tell you. They are well worth the trouble AND the clean-up. To keep the chicken nuggets moist, they are first brined in a solution of water, salt, and Worcestershire Sauce. I’m a huge fan of Worcestershire sauce and am always amazed by how many things it can make taste better. If in doubt, use Worcestershire sauce is a perfectly good kitchen rule. Brining helps keep the meat juicy while frying and it also gives a wonderful seasoning to the meat. To create an extra-crispy coating, the chicken nuggets are coated in a flour/panko crumb mixture, left to rest for 10 minutes, and then recoated. A touch of baking soda in the mixture helps the nuggets brown quickly in the oil. The recipe calls for crushed Panko crumbs and after a few minutes of rather unsuccessfully trying to crush them with the bottom of a measuring cup, I put them through a quick whirl in my food processor. I like to fry in peanut oil, but Yikes! that stuff seems to be getting more and more expensive. You could always use Vegetable oil as a lower cost alternative. 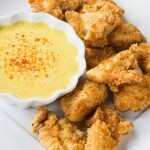 I’m a big fan of chicken nuggets and honey mustard so I made a homemade honey mustard dipping sauce. Whether you cook these crispy chicken nuggets up for a weeknight meal or serve them on a platter for a football game, there are sure to be plenty of smiling faces. 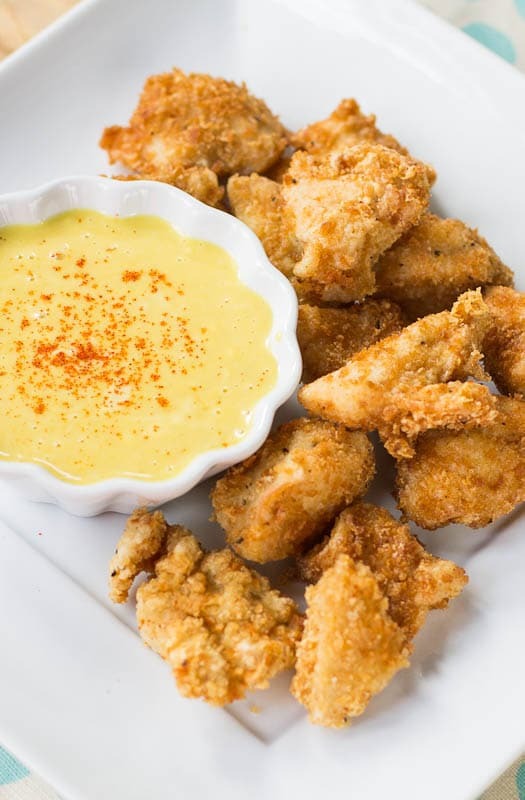 Homemade Chicken Nuggets with a crispy coating served with a honey mustard dipping sauce. You won't want fast food nuggets ever again. Cut chicken breasts into 1-inch chunks. In a medium bowl, whisk together water, 1 tablespoon of salt, and Worcestershire sauce until salt dissolves. Add chicken, stir to coat chicken well, and place in refrigerator for 30 minutes. While chicken is brining, combine flour, panko bread crumbs, onion powder, remaining salt, pepper, garlic powder, and baking soda in a pie plate or shallow dish. In a second shallow dish, whisk the egg whites until foamy. Remove chicken from brine and discard the brine. Pat chicken dry with paper towels. Coat chicken in egg white and then dredge in flour mixture. Place on a plate and let sit 10 minutes. Heat oil in a large Dutch oven over medium-high heat to a temperature of 350 degrees. Recoat chicken in flour mixture, pressing mixture on with your fingers. Working in 2 batches, fry chicken until golden brown, flipping once. This will take approximately 3 minutes total. Place chicken on top of a wire rack set in a large, rimmed baking sheet. Chicken can be kept warm in a 200 degree oven. 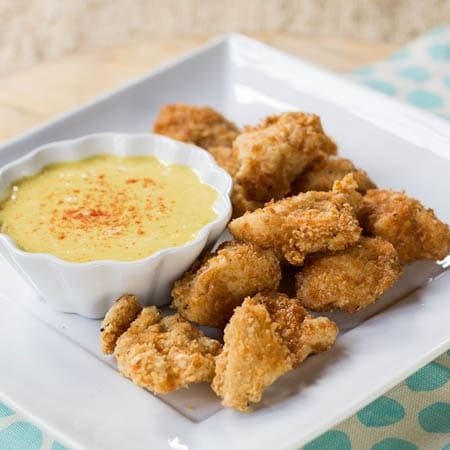 To make dipping sauce, combine mayonnaise, both mustards, honey, and cayenne pepper in a bowl. This entry was posted in Main Dishes and tagged chicken, Cook's Country Magazine, poultry, weeknight meals. Bookmark the permalink. looking for a nugget recipe, think i hit jack pot. Making this in the morning for hussy to take to work…. will let you know the out come. These look SO crispy and they sound so full of flavor with Worcestershire sauce as a brine and those delicious spices! That honey mustard sauce sounds like a winner, too. I hate frying as well, but when a dish is worth the mess like this one, I will do it! Thanks Marcie! You are right, the Worcestershire sauce does wonders for the flavor! I love chicken nuggets! Totally making these. You will love this recipe Matt!